﻿My favorite question from my clients is, "How did you become a hairstylist?" Well, I believe that, the more they get to know me the more they know that I have a variety of interests and experiences. My passion, of course, is Hairstyling. Once upon a time, I was a midwife. Until I met my prince and moved to the United States in 1980. Today, my world is composed of my daughter Meredith, my love for style and beauty, and filling every waking moment with laughter and friendship. To learn more about me, please visit my Blog! 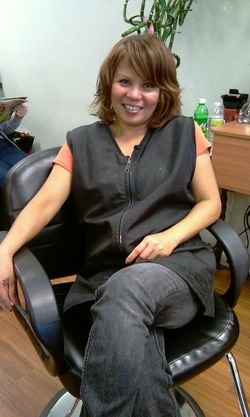 I attended Ponce Beauty School in Santa Clara, and worked in several beauty salons in Mountain View. An opportunity was offered to me to own my own salon in Fremont. In 1987, I established my salon and named it Meredith's Beauty Suite, after my daughter. It was my life and my community; my child was raised here. I grew up greatly through my experiences, the people I met, and the stories we shared - by the wisdom of their diverse minds and disparate points of view. What did inquiring minds want to know? Well, we discussed issues of the day. In 2007, I partnered with three stylists to found New Stage Hair Salon, a beautiful place, uniquely rich in its multiple cultures. It is a totally interconnected new world. You can find me at New Stage Hair Salon where I continue to grow my clientele, enjoying every moment that I get to craft exciting styles for my clients. Welcome to Helena Curry's Website! Hi, this is Meredith Curry, daughter to Helena Curry at New Stage Hair Salon. If you are a client of Helena's, then you know as well as I do that she is not just a charming friend and loving mother. Helena is a class act in the Beauty Industry, who enjoys working with people to highlight everything that makes them beautiful. She feels accomplishment and satisfaction when she can see your head lifted high, walking out of the salon with confidence and style, every time you get up from her chair. If you are a potential customer wanting to learn more about Helena's work, check back here every now and then for updates in her Styles by Helena page! More photos are on the way! To make an appointment, call her today at (510) 793-4300! Lastly, if you have a Yelp account, please click here to take a few minutes to write a review of Helena. Make sure to indicate that your review is for Helena!